Biodynamics has much in common with other organic approaches – it emphasizes the use of manures and composts and excludes the use of artificial chemicals on soil and plants. Methods unique to the biodynamic approach include its treatment of animals, crops, and soil as a single system, an emphasis from its beginnings on local production and distribution systems, its use of traditional and development of new local breeds and varieties. Some methods use an astrological sowing and planting calendar. Biodynamic agriculture uses various herbal and mineral additives for compost additives and field sprays; these are prepared using methods that are more akin to sympathetic magic than agronomy, such as burying ground quartz stuffed into the horn of a cow, which are said to harvest "cosmic forces in the soil." No difference in beneficial outcomes has been scientifically established between certified biodynamic agricultural techniques and similar organic and integrated farming practices. Biodynamic agriculture lacks strong scientific evidence for its efficacy and has been labeled a pseudoscience because of its overreliance upon esoteric knowledge and mystical beliefs. As of 2019, biodynamic techniques were used on 187.549 hectares in 55 countries. Germany accounts for 45% of the global total; the remainder average 1750 ha per country. Biodynamic methods of cultivating grapevines have been taken up by several notable vineyards. There are certification agencies for biodynamic products, most of which are members of the international biodynamics standards group Demeter International. 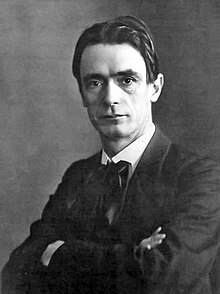 Rudolf Steiner, occultist philosopher and founder of "anthroposophic agriculture", later known as "biodynamic". Biodynamics was the first modern organic agriculture. Its development began in 1924 with a series of eight lectures on agriculture given by philosopher Rudolf Steiner at Schloss Koberwitz in Silesia, Germany (now Kobierzyce in Poland). These lectures, the first known presentation of organic agriculture, were held in response to a request by farmers who noticed degraded soil conditions and a deterioration in the health and quality of crops and livestock resulting from the use of chemical fertilizers. The 111 attendees, less than half of whom were farmers, came from six countries, primarily Germany and Poland. The lectures were published in November 1924; the first English translation appeared in 1928 as The Agriculture Course. Steiner emphasized that the methods he proposed should be tested experimentally. For this purpose, Steiner established a research group, the "Agricultural Experimental Circle of Anthroposophical Farmers and Gardeners of the General Anthroposophical Society". Between 1924 and 1939, this research group attracted about 800 members from around the world, including Europe, the Americas and Australasia. Another group, the "Association for Research in Anthroposophical Agriculture" (Versuchsring anthroposophischer Landwirte), directed by the German agronomist Erhard Bartsch, was formed to test the effects of biodynamic methods on the life and health of soil, plants and animals; the group published a monthly journal, Demeter. Bartsch was also instrumental in developing a sales organisation for biodynamic products, Demeter, which still exists today. The Research Association was renamed the Imperial Association for Biodynamic Agriculture (Reichsverband für biologisch-dynamische Wirtschaftsweise) in 1933. It was dissolved by the National Socialist regime in 1941. In 1931 the association had 250 members in Germany, 109 in Switzerland, 104 in other European countries and 24 outside Europe. The oldest biodynamic farms are the Wurzerhof in Austria and Marienhöhe in Germany. Today biodynamics is practiced in more than 50 countries worldwide and in a variety of circumstances, ranging from temperate arable farming, viticulture in France, cotton production in Egypt, to silkworm breeding in China. :141 Demeter International is the primary certification agency for farms and gardens using the methods. In Australia, the first biodynamic farmer was Ernesto Genoni who in 1928 joined the Experimental Circle of Anthroposophical Farmers and Gardeners, followed soon after by his brother Emilio Genoni. Ileen Macpherson and Ernesto Genoni founded Demeter Biological Farm at Dandenong, Victoria, in 1934 and it was farmed using biodynamic principles for over two decades. Bob Williams presented the first public lecture in Australia on biodynamic agriculture on 26 June 1938 at the home of the architects Walter Burley Griffin and Marion Mahony Griffin at Castlecrag, Sydney. Since the 1950s research work has continued at the Biodynamic Research Institute (BDRI) in Powelltown, near Melbourne under the direction of Alex Podolinsky. In 1989 Biodynamic Agriculture Australia was established, as a not for profit association. In 1928 the Anthroposophical Agricultural Foundation was founded in England; this is now called the Biodynamic Agriculture Association. In 1939, Britain's first biodynamic agriculture conference, the Betteshanger Summer School and Conference on Biodynamic Agriculture, was held at Lord Northbourne's farm in Kent; Ehrenfried Pfeiffer was the lead presenter. In the United States, the Biodynamic Farming & Gardening Association was founded in 1938 as a New York state corporation. In France the International Federation of Organic Agriculture Movements (IFOAM) was formed in 1972 with five founding members, one of which was the Swedish Biodynamic Association. The University of Kassel had a Department of Biodynamic Agriculture from 2006 to March 2011. In common with other forms of organic agriculture, biodynamic agriculture uses management practices that are intended to "restore, maintain and enhance ecological harmony." Central features include crop diversification, the avoidance of chemical soil treatments and off-farm inputs generally, decentralized production and distribution, and the consideration of celestial and terrestrial influences on biological organisms. The Demeter Association recommends that "(a) minimum of ten percent of the total farm acreage be set aside as a biodiversity preserve. That may include but is not limited to forests, wetlands, riparian corridors, and intentionally planted insectaries. Diversity in crop rotation and perennial planting is required: no annual crop can be planted in the same field for more than two years in succession. Bare tillage year round is prohibited so land needs to maintain adequate green cover." The Demeter Association also recommends that the individual design of the land "by the farmer, as determined by site conditions, is one of the basic tenets of biodynamic agriculture. This principle emphasizes that humans have a responsibility for the development of their ecological and social environment which goes beyond economic aims and the principles of descriptive ecology. ":141–142 Crops, livestock, and farmer, and "the entire socioeconomic environment" form a unique interaction, which biodynamic farming tries to "actively shape ...through a variety of management practices. The prime objective is always to encourage healthy conditions for life": soil fertility, plant and animal health, and product quality. :141–142 "The farmer seeks to enhance and support the forces of nature that lead to healthy crops, and rejects farm management practices that damage the environment, soil plant, animal or human health....the farm is conceived of as an organism, a self-contained entity with its own individuality,":148 holistically conceived and self-sustaining. "Disease and insect control are addressed through botanical species diversity, predator habitat, balanced crop nutrition, and attention to light penetration and airflow. Weed control emphasizes prevention, including timing of planting, mulching, and identifying and avoiding the spread of invasive weed species." Biodynamic agriculture differs from many forms of organic agriculture in its spiritual, mystical, and astrological orientation. It shares a spiritual focus, as well as its view toward improving humanity, with the "nature farming" movement in Japan. :5 Important features include the use of livestock manures to sustain plant growth (recycling of nutrients), maintenance and improvement of soil quality, and the health and well being of crops and animals. Cover crops, green manures and crop rotations are used extensively and the farms to foster the diversity of plant and animal life, and to enhance the biological cycles and the biological activity of the soil. Biodynamic farms often have a cultural component and encourage local community, both through developing local sales and through on-farm community building activities. Some biodynamic farms use the Community Supported Agriculture model, which has connections with social threefolding. Compared to non-organic agriculture, BD farming practices have been found to be more resilient to environmental challenges, to foster a diverse biosphere, and to be more energy efficient, factors Eric Lichtfouse describes being of increasing importance in the face of climate change, energy scarcity and population growth. Some improvement in nutrient content of compost is evident from the ingredients included, but not necessarily as a result of the practices and exact preparations as Steiner described them. Although the preparations have direct nutrient values, modern biodynamic practitioners believe their benefit is to support the self-regulating capacities of the biota already present in the soil and compost. Critics of the practice have pointed out that no evidence or logic underlies the practices themselves, which instead are dependent on magical thinking and debunked theories of Steiner himself. There is no evidence that biodynamic practices have any benefit beyond the direct nutrients they add as fertilizer, which may itself be of smaller benefit than other traditionally organic or commercial fertilizers. 500: A humus mixture prepared by filling a cow's horn with cow manure and burying it in the ground (40–60 cm below the surface) in the autumn. It is left to decompose during the winter and recovered for use as fertilizer the following spring. 501: Crushed powdered quartz stuffed into a cow's horn and buried in the ground in springtime and taken out in autumn. It can be mixed with 500 but is usually prepared on its own. The mixture is sprayed under very low pressure over the crop during the wet season, as a supposed antifungal. 502: Yarrow blossoms (Achillea millefolium) stuffed into the urinary bladders from red deer (Cervus elaphus), placed in the sun during summer, buried in the ground during winter, and retrieved in the spring. 503: Chamomile blossoms (Matricaria recutita) stuffed into the small intestines of cattle, buried in humus-rich earth in the autumn, and retrieved in the spring. 504: Stinging nettle (Urtica dioica) plants in full bloom stuffed together underground surrounded on all sides by peat for a year. 505: Oak bark (Quercus robur) chopped in small pieces, placed inside the skull of a domesticated animal, surrounded by peat, and buried in the ground in a place near rain runoff. 506: Dandelion flowers (Taraxacum officinale) stuffed into the mesentery of a cow, buried in the ground during winter, and retrieved in the spring. 507: Valerian flowers (Valeriana officinalis) extracted into water. The approach considers that there are lunar and astrological influences on soil and plant development—for example, choosing to plant, cultivate or harvest various crops based on both the phase of the moon and the zodiacal constellation the moon is passing through, and also depending on whether the crop is the root, leaf, flower, or fruit of the plant. This aspect of biodynamics has been termed "astrological" and "pseudoscientific" in nature. Biodynamic agriculture has focused on the open pollination of seeds (with farmers thereby generally growing their own seed) and the development of locally adapted varieties. The Demeter biodynamic certification system established in 1924 was the first certification and labelling system for organic production. :5 As of 2018, to receive certification as biodynamic, the farm must meet the following standards: agronomic guidelines, greenhouse management, structural components, livestock guidelines, and post-harvest handling and processing procedures. The term Biodynamic is a trademark held by the Demeter association of biodynamic farmers for the purpose of maintaining production standards used both in farming and processing foodstuffs. The trademark is intended to protect both the consumer and the producers of biodynamic produce. Demeter International an organization of member countries; each country has its own Demeter organization which is required to meet international production standards (but can also exceed them). The original Demeter organization was founded in 1928; the U.S. Demeter Association was formed in the 1980s and certified its first farm in 1982. In France, Biodivin certifies biodynamic wine. In Egypt, SEKEM has created the Egyptian Biodynamic Association (EBDA), an association that provides training for farmers to become certified. As of 2006, more than 200 wineries worldwide were certified as biodynamic; numerous other wineries employ biodynamic methods to a greater or lesser extent. Research into biodynamic farming has been complicated by the difficulty of isolating the distinctively biodynamic aspects when conducting comparative trials. Consequently, there is no strong body of material that provides evidence of any specific effect. Since biodynamic farming is a form of organic farming, it can be generally assumed to share its characteristics, including "less stressed soils and thus diverse and highly interrelated soil communities". had greater earthworm populations and biomass than conventional farms. Both factors were similar to the result in organically cultivated fields. In a 2002 newspaper editorial, Peter Treue, agricultural researcher at the University of Kiel, characterized biodynamics as pseudoscience and argued that similar or equal results can be obtained using standard organic farming principles. He wrote that some biodynamic preparations more resemble alchemy or magic akin to geomancy. In a 1994 analysis, Holger Kirchmann, a soil researcher with the Swedish University of Agricultural Sciences, concluded that Steiner's instructions were occult and dogmatic, and cannot contribute to the development of alternative or sustainable agriculture. According to Kirchmann, many of Steiner's statements are not provable because scientifically clear hypotheses cannot be made from his descriptions. Kirchmann asserted that when methods of biodynamic agriculture were tested scientifically, the results were unconvincing. Further, in a 2004 overview of biodynamic agriculture, Linda Chalker-Scott, a researcher at Washington State University, characterized biodynamics as pseudoscience, writing that Steiner did not use scientific methods to formulate his theory of biodynamics, and that the later addition of valid organic farming techniques has "muddled the discussion" of Steiner's original idea. Based on the scant scientific testing of biodynamics, Chalker-Scott concluded "no evidence exists" that homeopathic preparations improve the soil. In Michael Shermer's The Skeptic Encyclopedia of Pseudoscience, Dan Dugan says that the way biodynamic preparations are supposed to be implemented are formulated solely on the basis of Steiner's "own insight". Skeptic Brian Dunning writes "the best way to think of 'biodynamic agriculture' would be as a magic spell cast over an entire farm. Biodynamics sees an entire farm as a single organism, with something that they call a life force." Philosopher of science Michael Ruse has written that followers of biodynamic agriculture rather enjoy the scientific marginalisation that comes from its pseudoscientific basis, revelling both in its esoteric aspects and the impression that they were in the vanguard of the wider anti-science sentiment that has grown in opposition to modern methods such as genetic modification. Steiners theory was similar to those of the agricultural scientist Richard Krzymowski, who was teaching in Breslau since 1922. The environmental scientist Frank M. Rauch mentioned in 1995, concerning the reprint of a book from Raoul Heinrich Francé, another source probably used by Steiner. ^ Lejano RP, Ingram M, Ingram HM (2013). "Chapter 6: Narratives of Nature and Science in Alternative Farming Networks". Power of Narrative in Environmental Networks. MIT Press. p. 155. ISBN 9780262519571. ^ a b c d Paull, John (2011). "Attending the First Organic Agriculture Course: Rudolf Steiner's Agriculture Course at Koberwitz, 1924". European Journal of Social Sciences. 21 (1): 64–70. ^ a b c d Vogt G (2007). Lockeretz W (ed.). Chapter 1: The Origins of Organic Farming. Organic Farming: An International History. CABI Publishing. pp. 9–30. ISBN 9780851998336. ^ Ikerd, John (2010). "Sustainability, Rural". In Leslie A. Duram (ed.). Encyclopedia of Organic, Sustainable, and Local Food. ABC-CLIO. pp. 347–49. ISBN 978-0313359637. ^ Abbott, L. K.; Murphy, Daniel V. (2007). Soil Biological Fertility: A Key to Sustainable Land Use in Agriculture. Springer. p. 233. ISBN 978-1402066184. ^ a b Ruse M (2013). Pigliucci M, Boudry M (eds.). Chapter 12: Evolution – From Pseudoscience to Popular Science, from Popular Science to Professional Science. Philosophy of Pseudoscience: Reconsidering the Demarcation Problem. University of Chicago Press. p. 227. ISBN 978-0-226-05182-6. ^ "Demeter Monitor 2017/2018 (page 6)" (PDF) (in Dutch). Retrieved 2019-03-15. ^ a b Reeve, Jennifer R.; Carpenter-Boggs, Lynne; Reganold, John P.; York, Alan L.; McGourty, Glenn; McCloskey, Leo P. (December 1, 2005). "Soil and Winegrape Quality in Biodynamically and Organically Managed Vineyards". American Journal of Enology and Viticulture. 56 (4): 367–76. ISSN 0002-9254. OCLC 60652537. ^ Traditional agriculture employed organic practices in the absence of any alternative. ^ Paull, John (2013) "Koberwitz (Kobierzyce); In the footseps of Rudolf Steiner'", Journal of Bio-Dynamics Tasmania, 109 (Autumn), pp. 7–11. ^ Paull, John (2013) "Breslau (Wrocław): In the footsteps of Rudolf Steiner", Journal of Bio- Dynamics Tasmania, 110: 10–15. ^ a b Diver (1999), "Introduction" Archived 2011-05-26 at the Wayback Machine. ^ a b Paull, John (2013) A history of the organic agriculture movement in Australia. In: Bruno Mascitelli, and Antonio Lobo (Eds.) Organics in the Global Food Chain. Connor Court Publishing, Ballarat, ch.3, pp. 37–61. ^ a b c Paull, John (2011). "Biodynamic Agriculture: The Journey from Koberwitz to the World, 1924–1938". Journal of Organic Systems. 6 (1): 27–41. ^ a b c Paull, John (2011) "The Betteshanger Summer School: Missing link between biodynamic agriculture and organic farming", Journal of Organic Systems, 6(2):13–26. ^ Paull, John (2015) "Ernesto Genoni: Artist, Pacifist, Anthroposophist", Uriel Lecture, Christian Community, Hawthorn, pp. 1–67. ^ Paull, John (2014) "Ernesto Genoni: Australia’s pioneer of biodynamic agriculture", Journal of Organics, 1(1):57–81. ^ Paull, John (2017) Ileen Macpherson: Life and tragedy of a pioneer of biodynamic farming at Demeter Farm and a benefactor of Anthroposophy in Australia, Journal of Organics, 4(1):29–56. ^ Paull, John (2012) "Walter Burley Griffin and Marion Mahony Griffin, Architects of Anthroposophy", Journal of Bio-Dynamics Tasmania, 106: 20–30. ^ Paull, John (2010) "From France to the World: The International Federation of Organic Agriculture Movements (IFOAM)", Journal of Social Research & Policy, 1(2):93–102. ^ a b c d Lotter, Donald W. (2003). "Organic Agriculture". Journal of Sustainable Agriculture. 21 (4): 59–128. doi:10.1300/J064v21n04_06. ISSN 1044-0046. ^ K. Padmavathy; G. Poyyamoli (2011). Lichtfouse, Eric (ed.). Genetics, biofuels and local farming system. Berlin: Springer. p. 387. ISBN 978-94-007-1520-2. ^ Kirchmann, H.; Thorvaldsson, G.; Bergstrom, L.; Gerzabek, M.; Andren, O.; Eriksson, L.O. ; Winninge, M. (2008). Fundamentals of organic agriculture (PDF). Organic Crop Production--Ambitions and Limitations. pp. 13–37. doi:10.1007/978-1-4020-9316-6_2. ISBN 978-1-4020-9315-9. Archived from the original (PDF) on 2016-03-12. Retrieved 2009-07-01. ^ a b Chhabra, Esha (5 March 2017). "Biodynamic farming is on the rise – but how effective is this alternative agricultural practice?". The Guardian. Retrieved 5 December 2018. ^ Raupp, J. and U.J. König. (1996). "Biodynamic preparations cause opposite yield effects depending upon yield levels." Biol. Agric. & Hort. 13, pp. 175–88. ^ Chalker-Scott, Linda (December 2013). "The Science Behind Biodynamic Preparations: A Literature Review". HortTechnology. 23 (6): 814–819. Retrieved 5 December 2018. ^ Desai, B K (2007). Sustainable agriculture: a vision for the future. New Delhi: B T Pujari/New India Pub. Agency. pp. 228–29. ISBN 978-81-89422-63-9. ^ Biodynamic Tea (2007), "Beyond Organic Biodynamic Tea". ^ Diver (1999), "Planetary Influences" Archived 2011-05-26 at the Wayback Machine. ^ Novella, Steven (19 June 2017). "Biodynamic Farming and Other Nonsense". NeuroLogica Blog. The New England Skeptical Society. Retrieved 5 December 2018. ^ Stableford, Brian M. (1 July 2015). Science fact and science fiction : an encyclopedia. Routledge. p. 42. ISBN 978-1138868823. Retrieved 5 December 2018. ^ Nemoto, K.; Nishikawa, Y. (2007). "Seed supply system for alternative agriculture: Case study of biodynamic agriculture in Germany". Journal of the Faculty of Agriculture. Shinshu University, Japan. 43 (1–2): 73–81. ^ Paul Gregutt, "Not Woo-Woo Anymore: More and more wineries are tasting the benefits of saving the soil", The Seattle Times, November 20, 2005. Reprint copy Archived May 25, 2008, at the Wayback Machine. Accessed 2008-01-26. ^ a b Turinek, M.; Grobelnik-Mlakar, S.; Bavec, M.; Bavec, F. (2009). "Biodynamic agriculture research progress and priorities". Renewable Agriculture and Food Systems. 24 (2): 146–54. doi:10.1017/S174217050900252X. ^ Kirchmann, Holger (1994). "Biological dynamic farming – an occult form of alternative agriculture?". J. Agric. Environ. Ethics. 7 (2): 173–87. doi:10.1007/BF02349036. ^ Chalker-Scott, Linda (2004). "The Myth of Biodynamic Agriculture" (PDF). Master Gardener Magazine. Archived (PDF) from the original on 29 August 2017. ^ Dugan D (2002). Shermer M (ed.). Anthroposophy and Anthroposophical Medicine. The Skeptic Encyclopedia of Pseudoscience. 2. ABC-CLIO. p. 32. ISBN 978-1-57607-653-8. ^ Dunning, Brian. "Skeptoid #26: Biodynamic Agriculture". Skeptoid. Retrieved 2011-12-12. ^ Helmut Zander (2011). Rudolf Steiner. Die Biographie. Piper, Munich. p. 458. ISBN 978-3-492-05448-5. ^ Frank M. Rauch (1995). "Lebendige Erde". Zur Neuauflage: Francé Das Leben im Boden und Das Edaphon, Report about the new edition. Edition Siebeneicher. Biodynamic Agricultural Association (n.d.). "How does the Calendar work?". Biodynamic Frequently Asked Questions. The Biodynamic Agricultural Association (UK). Archived from the original on 2007-09-28. Retrieved 2007-10-05. Burkitt, L.L. ; D R. Small; J.W. McDonald; W.J. Wales; M.L. Jenkin (2007a). "Comparing irrigated biodynamic and conventionally managed dairy farms. 1. Soil and pasture properties". Australian Journal of Experimental Agriculture. 47 (5): 479–88. doi:10.1071/EA05196. OCLC 12490171. Burkitt, L.L. ; W.J. Wales; J.W. McDonald; D R. Small; M.L. Jenkin (2007b). "Comparing irrigated biodynamic and conventionally managed dairy farms. 2. Milk production and composition and animal health". Australian Journal of Experimental Agriculture. 47 (5): 489–94. doi:10.1071/EA06085. OCLC 12490171. Diver, Steve (1999). "Biodynamic Farming & Compost Preparation (ATTRA Publication #IP137)". ATTRA - National Sustainable Agriculture Information Service. Archived from the original on 2011-05-26. Retrieved 2007-10-05. Harwood, Richard R. (1990). "A History of Sustainable Agriculture". In Clive A. Edwards; Rattan Lal; Patrick Madden; Robert H. Miller; Gar House (eds.). Sustainable Agricultural Systems. Ankeny, IA: Soil and Water Conservation Society. pp. 3–19. ISBN 978-0-935734-21-8. OCLC 20933949. Koepf, Herbert (2009). Research in Biodynamic Agriculture: Methods and Results. Biodynamic Farm and Gardening Association. ISBN 978-0-938250-34-0. Kristiansen, Paul (2006). "Overview of organic agriculture" (PDF). In Paul Kristiansen; Acram Taji; John Reganold (eds.). Organic Agriculture: A Global Perspective (online sample reprint ed.). Collingwood, VIC: CSIRO Publishing. pp. 1–23. ISBN 978-0-643-09090-3. OCLC 71801183. Mäder, Paul; Andreas Fließbach; David Dubois; Lucie Gunst; Padruot Fried; Urs Niggli (2002). "Soil fertility and biodiversity in organic farming". Science. 296 (5573): 1694–97. doi:10.1126/science.1071148. OCLC 1644869. PMID 12040197. Archived from the original (Summary) on October 25, 2007. Retrieved 2007-10-11. Martinez, A.W. (1952-05-31). "The City With Golden Garbage" (Reprint). Collier's Weekly. Springfield, OH: Crowell-Collier. OCLC 8755061. Retrieved 2007-10-05. Nastati, Enzo (2010). "Commentary on Dr Rudolf Steiner's Agriculture Course". MM Publications. Eskenazi, Joe (2010). "Voodoo on the Vine". SF Weekly. Pfeiffer, Ehrenfried (2006) . Soil Fertility, Renewal and Preservation: Bio-Dynamic Farming and Gardening. Delhi, India: Asiatic Publishing House. ISBN 978-81-87067-73-3. Schilthuis, Willy (2003). Biodynamic Agriculture. Floris Books. ISBN 978-0-86315-397-6. Proctor, Peter (1997). Grasp the Nettle: Making Biodynamic Farming & Gardening Work. With Gillian Cole. Random House.